Download the Request Form to your desktop. Open it with Acrobat Reader. Fill out the form by clicking on each blue field. Work with a fire service department to request the trailer if you are already associated with them. They usually have some familiarity with the request process. Requests must be made at least one month in advance of your event and not more than one year in advance. Cancellations should be at least two days in advance. Alarms – carbon monoxide, smoke alarms and smoke alarms with strobe. A minimum of three (3) fire service members is suggested and a maximum of seven (8) students in each room is recommended. Houses are approximately 30 feet in length and need a nearby power source. Caution must be used when young children or those with asthma are watching a demonstration using the non-toxic smoke and realistic smoke alarms. It is the department’s responsibility to take care of, clean and repair any damage caused to the trailers while under their use. Our Earthquake Safety Trailer is a great education tool. The trailer simulates the intensity of an earthquake with vibrations and loud noises (nothing shakes or falls). The trailer can accommodate 8-12 people at a time and the presentations inside can be catered to the population present in the trailer. Only State Fire Marshal representatives are allowed to transport and present the Earthquake Trailer. Only requests with completed Lending Request Forms will be accepted. Requests should be made at least one month in advance of your event and not more than one year in advance. Please understand that evening, night and weekend events are more difficult for our staff to accommodate. 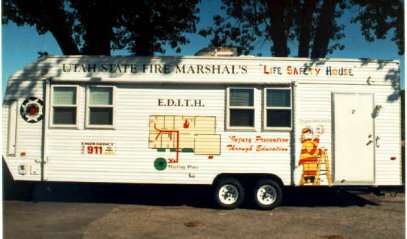 At least two Fire Marshal representatives are required to present the trailer. Bookings depend on trailer AND staff availability. Our office reserves the right to cancel a trailer delivery at any time, for any reason.